Before you decide to buy a shipping container for portable storage, consider this list of 10 tips to keep your costs low, and your stored items safe, secure, and in the best condition. Improve Security: New shipping containers can come equipped with lockboxes, but with a used container that’s not always the case. A bolt-on lockbox increases the security of the container by making the lock inaccessible on all sides but the bottom, and nearly impossible to cut the shank. Consider your security needs carefully. Delivery Method: There are two common types of trucks that can deliver a shipping container: a roll off, or tilt bed, and a flatbed truck. A flatbed truck is cheaper than a tilt bed, but if you don’t have a forklift on site it may not be an option. If you’re more than 100 miles from the origination point of the container, research the cost of renting a forklift and add that to the cost of a delivery that uses a flatbed truck. Compare that total to a delivery that uses a tilt bed. Building Permits: Find out if you need a building permit for a structure that isn’t on a permanent foundation. In many places you won’t need one. If you’re putting a container onto railroad ties or a concrete slab you may not need a permit like you would if you were constructing an outbuilding or shed. Total Costs: When looking at the cost of a container, don’t just look at purchase price of the unit. Include that, as well as delivery, time and anything related. Do the same for the cost of a constructed building, by including material fees, delivery fees, cost of construction time and other related materials. A container may become the more financially conservative option. New or Used Shipping Containers: Depending on what your plans for the container are, the cost of a new shipping container may outweigh the price of a used container. Proper Ventilation: Does your area experience wide temperature variances? If so, you might experience condensation inside of the container. If so, will this damage the contents? This can be prevented by installing some type of ventilation system inside of the container. This could be a basic HVAC system or vents. Finding the Best Priced Container: Cheapest doesn’t always equal best and that is certainly true with shipping containers. Consider the condition and what options are available. New portable storage containers are pretty standard in terms of options and features, and of course, they should be in pristine condition. A used portable storage container can vary greatly from its counterparts in terms of condition and price. Get the Biggest Bang: Calculate the square footage you will need before going shopping. There are 20’ standard, 40’ standard, 40’ high cubes, and 40’ super high cubes. Obviously, they all provide a different amount of storage in a standard foot print size. If you want the best value for the size, calculate the price per square foot of each container. If you can get a little more square footage within your budget, weigh that option. It’s always good to have a little more space to move things about and access stored items. Shipping containers make a great portable storage solution, whether or not you need to move them from place to place. They can be placed quickly and are affordable, compared to a constructed building. 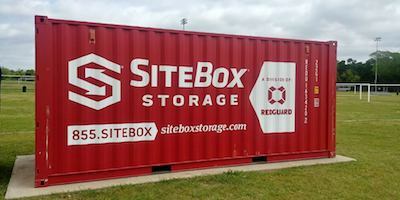 If you need information on portable storage, or want to look over availability, contact SiteBox Storage.